Today’s Paris memories are centered not far from city Hall — the Tour Saint-Jacques, a Gothic tower that is all that remains of a 16th century church that was mostly leveled just after the French Revolution. The tower’s rich decoration reflects the wealth of its patrons, the wholesale butchers of the former Les Halles market that existed nearby for centuries. It’s no longer possible to go to the top of the tower, or even to access the lowest level, but a tiny park welcomes visitors to its base. And from certain spots in the Les Halles neighborhood you can see the tower peaking over the nearby buildings. 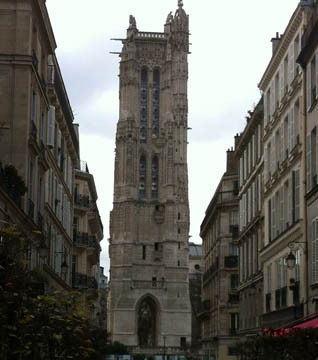 This entry was posted in Les Halles, Sight-seeing and tagged Les Halles, sight-seeing, Tour Saint-Jacques by Bob Adams. Bookmark the permalink.